Since the 1700s, Royal Crown Derby has been creating classic designs that are both functional and collectible. Rich colors and intricate gilding remain the distinguishing features of its exquisite craftsmanship. For in-store inquiries, use sku #673537. Hand-painted porcelain salad plate. 7.75"Dia. Hand wash. Made in Hungary. This is a special order pattern. If not in stock, please allow up to 4 months for creation and delivery. White porcelain. Border, stylized Christmas trees and stalwart nutcrackers; holly garland and dainty gold and green accents. Salad plate, 8 1/2" diameter. Made in France. 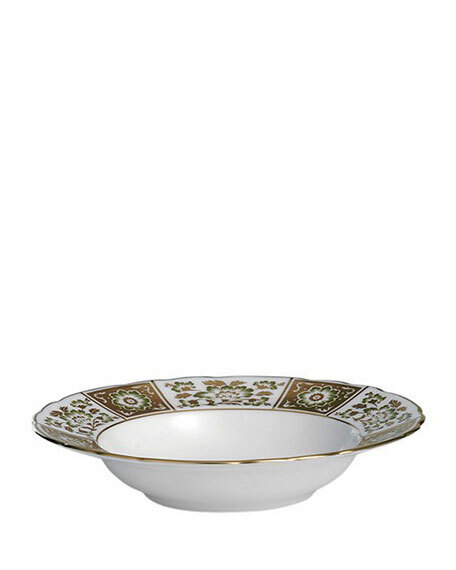 Fine French Limoges porcelain beautifully patterned in shades of taupe and rich gilding. 8.25"Dia. Dishwasher safe but hand washing recommended. Hand-detailed porcelain plate with chain-link border. 10.5"Dia. Hand washing recommended. Made in Italy.